James Burbage consulted Dr. John Dee (1527 1608) on the architecture of The Theatre. Dr. John Dee, renowned as a magician and alchemist, was also extremely knowledgeable about architecture. James Burbage relied on Dee's extensive architectural library to design the plans for the construction of The Theatre which was the forerunner of the Globe Theatre. The Globe Theatre Architecture was based on the great structures of classic antiquity. The design was based on a structure similar to the Coliseum in Ancient Rome. Architecture on a grand scale which would house a capacity of between 1500 and 3000 people. James Burbage built the very first theatre with his brother-in-law John Brayne. The architecture of 'The Theatre' was designed as a construction which was similar to a small Roman amphitheatre. Classic Greek and Roman architecture was admired by the Elizabethans and sometimes great columns framed the entrances of many great Elizabethan houses. Two great columns were included in the architecture of the Elizabethan theatres which were called 'Herculean' columns or pillars - these were elaborately painted to resemble marble. The architecture of the Globe theatre was deliberately designed to reflect easily recognisable elements of Roman or Greek architecture thus elevating the bad reputation of plays and actors to the much admired Greek or Roman classical plays! It had been assumed that the Globe Theatre had been an octagonal shaped building. This assumption was based on the illustrated Visscher map engraving of 1616. But recent archaeological evidence and other documents, such as the illustrated Hollar map, indicate that it was actually a 20-sided building. The Globe Theatre Architecture included the features of the existing blood sport rings, such as the Bear Garden, were used but with the addition of a fixed stage. The other important feature was the cobbled yard, as opposed to the bare earth floor suited to animals. The fashionable and practical Black and White Half Timbered style of architecture was emulated. The Globe Theatre was framed with massive upright, vertical timbers. These vertical timbers were supported by diagonal timbers. The wattle walls were daubed with mortar and whitewash was then applied. This process resulted in the highly distinctive black and white half-timbered Elizabethan style of architecture. The Globe Theatre Architecture also featured a thatched roof. The material used to make a thatched roof was either straw or reeds. Bundles of straw or reed were piled on to the frame of the roof. The bundles had a circumference of between 24 to 27 inches and could range from 3 to 7 feet long. 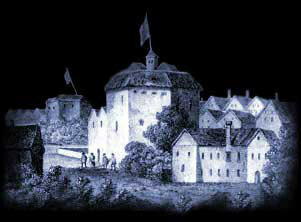 The thatched roof was a real fire hazard and in 1613 the original Globe theatre was burnt to the ground. A new Globe Theatre was built quickly, with one important addition. The new Globe Theatre boasted a tiled roof. Interesting Facts and information about the Globe Theatre Architecture. Additional details, facts and information about the Globe Theatre can be accessed via the Globe Theatre Sitemap.